and her column was on the reverse side...sometimes things just fall into place and the theme fits this week. 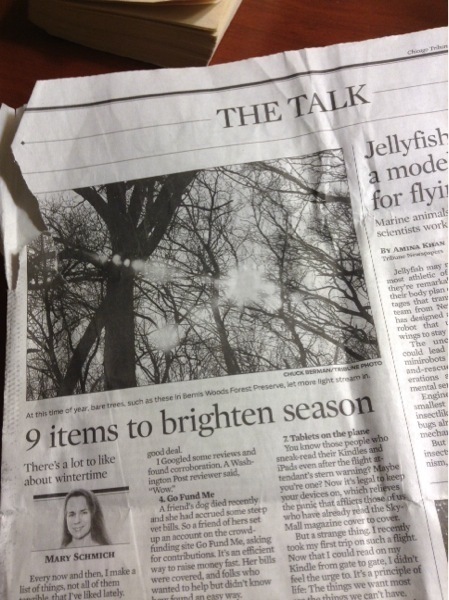 So, with a thank you to Ms. Schmich, here are my 5 ideas for brightening the season. 1. Traditions...Memories...We all have them. It was strange to see maple iced longjohns...of course this was in Chicago so it was topped with bacon as well...lots of things have bacon in Chicago. It was the maple part that captured my attention. I would have a gooey maple coated beauty for breakfast at my Grandparent's house when I stayed overnight ...I guess all the sentimentality of the Season hit me ...and I had to have one...the bacon was a nice addition. Good Samaritans do exist in the city. As we checked out, the desk clerk was pleased to inform me that part of our bill was covered by the previous guest. It seemed that guest was using a gift card and there was a remainder. That guest decided to leave it for the next person. What a nice surprise. Being Thanksgiving, it just seemed to fit...now to work on my part in paying it forward. I heard this was quite a nice event last year. Happy to see it returning. The Holidays wouldn't be the same without music. 4. Nature...preserved. While we were off Island, there was some news. 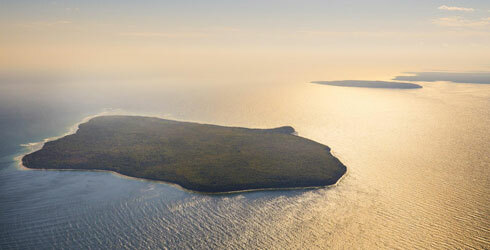 The Nature Conservancy announced the purchase of most of the acreage on St. Martin Island north of Washington Island. See this link for their release on the transition and campaign plans. Further info may be found in links posted on the Cottage on the Bay FaceBook Page. 5. Gifting...Little things...mean a lot. Here's a way to help that special someone remember a favorite spot on the Island... or just her favorite Island. Contact Laura Findlay Hagen to order or visit her Etsy shop...yes, she will mail your order and if it is done this week, it should make it to your door in time for Christmas. Cherish the memories, keep the traditions, and enjoy this time!